The originality of the UR103T is obvious at first glance: 4 highly visible rotating satellites bearing the hours take turns gliding past the minute arc. As they do, time is simultaneously indicated both digitally (hours) and analogically (minutes). The main horological challenge was ensuring the perfect balance of the rotating satellites - which are more than 300 times heavier than a traditional hand - while minimising friction, so that no energy is wasted. To do this Felix Baumgartner, master watchmaker and co-founder of URWERK, tested and selected the best performing material for the job: aluminium. The 4 satellites of the 103T are precisely crafted of aluminium for its optimal blend of strength and lightness. Each satellite is mounted on a bronze/beryllium Geneva cross and suspended from a orbital cross structure made from ARCAP 40: a material that is light, non-magnetic and corrosion resistant. 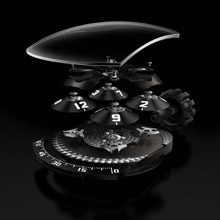 The satellites, each bearing 3 numbers, make a complete revolution of the dial every 4 hours and in that time turn four times 120°, to rotate 480° on their own axis. Each hour number displays the time as it advances slowly across the minute track. 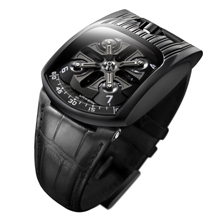 On the back of the UR103T is URWERK'S famous world premier ‘Control Board’. 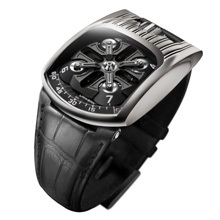 This wristwatch "dashboard" features a 43-hour power reserve indicator, a chronometer with minutes and seconds facilitating accurate time-setting and, in a nod to Abraham Louis Breguet, a precision adjustment screw making it possible for the owner to precisely regulate the timing on their UR103 to match their lifestyle.